The Red-Humped Eartheater can grow to 6 inches in a sufficiently large tank. This South American cichlid has a fierce appearance but is actually a rather peaceful species that can be kept in a community tank with other moderate-size fish. In the wild, it will root through muddy river bottoms looking for food. In the aquarium, it will root through the gravel, making it difficult to maintain live plants and impractical to use an under-gravel filter unit for biological filtration. Living Environment : All flake and freeze-dried foods are consumed, but as the Red-Humped Eartheater increases in size, pellet and tablet foods should be offered as well. Like most barbs, the Rosy Barb is an active swimmer. This hardy, peaceful species grows to 2.5 inches and should have a spacious tank. Males have decidedly darker fins than the females, and when they're ready to breed the males take on a deep pink hue. A long-finned variety of the Rosy Barb is also available. Living Environment : The Rosy Barb will take flake and freeze-dried foods and should receive additional vegetable flake food as well. The Red-Tailed Shark is not really a shark, despite its triangular dorsal fin and its common name. It grows to a length of 5 inches and is not particularly fond of its own kind. Either just one or a group of at least 4 or 5 should be kept in a tank. Living Environment : It does well on flake and freeze-dried foods. The Red-Tailed Shark is among the more attractive bottom dwellers, but its color will fade in poor-quality water. It is best to provide hiding places, and the Red-Tailed Shark prefers to have strong currents in the tank. Scissortail Rasboras are a larger species that will reach 3 inches and do well when kept in a school of six or eight. The coloring of this species is rather bland, but they're worth keeping for their behaviour and size. As large, active swimmers, they are an obvious presence in the tank. Their habit of repeatedly flicking their sharply forked tail fins adds interest and accounts for their common name. Living Environment : All flake and freeze-dried foods are accepted. Scissortail Rasboras are also skilful jumpers, so keep a tight-fitting lid on their tank. They should have adequate swimming space and darkish aqua capping. The Siamese Fighting Fish has been bred for its incredible variety of colors and long, flowing finnage. They are a colorful and attractive addition to any tank, but problems can arise in keeping them. Males are highly aggressive with each other and can't be kept in the same tank. Siamese Fighting Fish are also quite aggressive toward females most of the time. Although a single male can be kept in a small community aquarium, it will likely be harassed by any fin-nippers. Living Environment : Flake and freeze-dried foods high in protein are taken, as well as very small, floating pellet foods and live brine shrimp on occasion. The Spotted Pleco grows to 12 inches and requires hiding places. The Spotted Pleco is just one of many suckermouth catfish that will remove algae from flat surfaces in the tank. Some hobbyists find this species to be a nuisance, though, because of the way they rearrange aquascaping. Their bulk and careless swimming habits can uproot plants and overturn stones. Living Environment : These fish should have substantial amounts of vegetable material in their diet. In addition to pellet and tablet foods, sliced zucchini boiled just long enough for it to sink should also be offered. 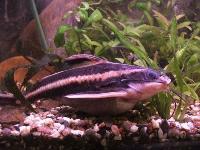 The Striped Raphael Catfish will grow to eight inches and should be kept in a tank with larger community fish. They are active at night, hiding during the day. When the tank light is turned off and a night light in the room is on, these active fish can be observed along with any other catfish in the tank. Living Environment : All flake and freeze-dried foods are taken, although larger specimens will benefit from pellet foods. The Stripe-Tailed Catfish grows to 4.5 inches. Subdued tank lighting and numerous hiding places in the tank are needed for this species, which becomes active at night. Living Environment : This peaceful, schooling fish will consume all flake and freeze-dried foods, but it should receive live brine shrimp as well. A hefty little catfish, the Stripe-Tailed Catfish comes from South America's Amazon River. It has not yet bred in captivity, so aquarists must depend on wild-caught specimens for their tanks. The Swordtail grows to 3.5 inches and appears in a variety of color patterns. This live-bearer is hardy as long as excellent water quality and frequent partial water changes are provided. It is an accomplished jumper, so a full aquarium hood with close-fitting openings for the filter and heater should be used. Males can become aggressive toward each other, so a tank should hold only one. Living Environment : It will eat all flake and freeze-dried foods and should be offered live brine shrimp occasionally. 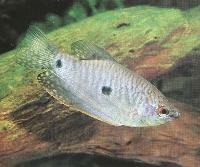 Also known as the Blue Gourami, the Three-Spot Gourami can reach four inches and is very peaceful. There is a great deal of color and pattern variation within this species; some have even lost the spots that inspired its common name. It is perfect for beginners and does well in community tanks even when small fish are present. Living Environment : The Three-Spot Gourami consumes all flake and freeze-dried foods.